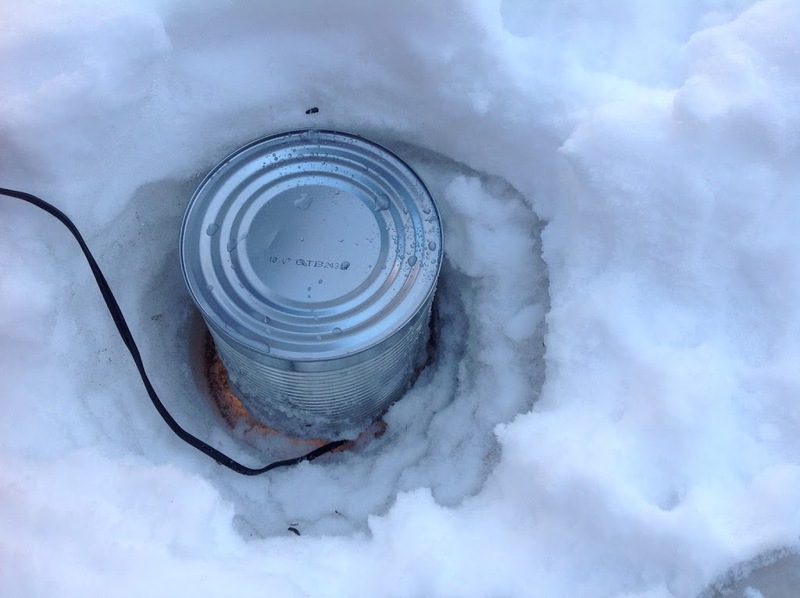 a restaurant-sized can that contained ketchup, tomato sauce, or canned vegetables. I cannot recall how many ounces or mL are in such a can, but usually the contents will transfer to 3 or 4 quart-sized Mason jars. An exterior extension cord, if necessary to reach from the outdoor outlet to the location you want to put the water heater. 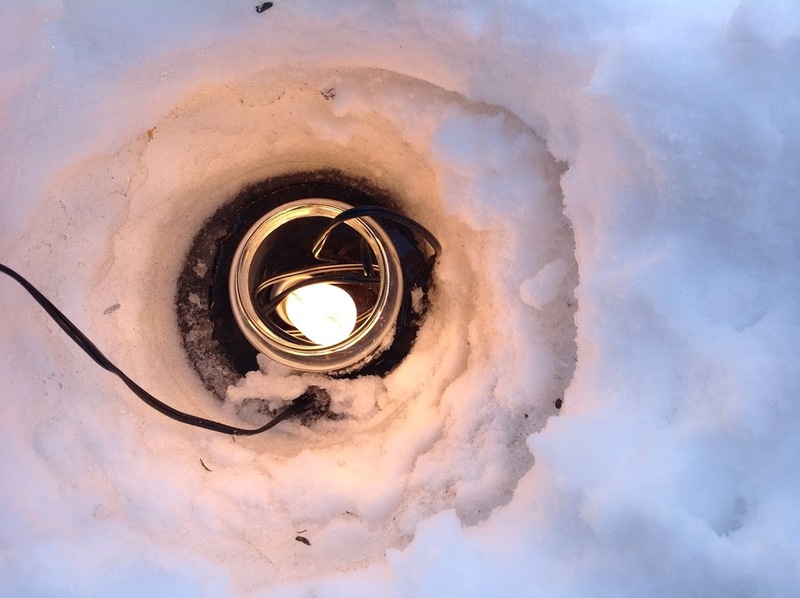 The basic principle is this: Incandescent lightbulbs shed enough heat to melt ice and snow. But we don’t want to really heat the water or waste excess electricity, so use the least wattage required – this bulb is going to be illuminated 24/7. 25 W works nicely, whether it has a standard base or a chandelier base. This will be under a support that will conduct that heat to the water, and remain sturdy for perching animals. The ever-ready bird/squirrel/feral-cat heated winter watering bowl! Bring the bowl (and rock) indoors once a week to give it a proper dishwashing, and replenish with fresh water when it gets low. Please note: Do NOT put any agents into the water to keep it from freezing. By “agents” I mean NO sugar, salt, or anything else. If your lightbulb isn’t keeping the water in a liquid state, chances are you’ll have to increase the wattage to put out more heat. 40 W will likely do when the weather’s a chilly -30 ºC. 50 W, if you’re in the Far North, or Rogers Pass, Montana. Why is this post timely? Project FeederWatch began in mid-November, the Christmas Bird Count is happening this month (mostly about two weeks from now, depending on your area), and the Great Backyard Bird Count is coming up in February. These three events are a citizen-science project that has taken place in North America for years (almost a century for the CBC, in fact), but in 2015, the GBBC went full-fledged (pun) global! For Project FeederWatch and the GBBC, all you have to do is watch your back yard for 15 minutes, a few times over the weekend, and send your observations to the associated websites for the projects (see Bird Studies Canada for more detail). 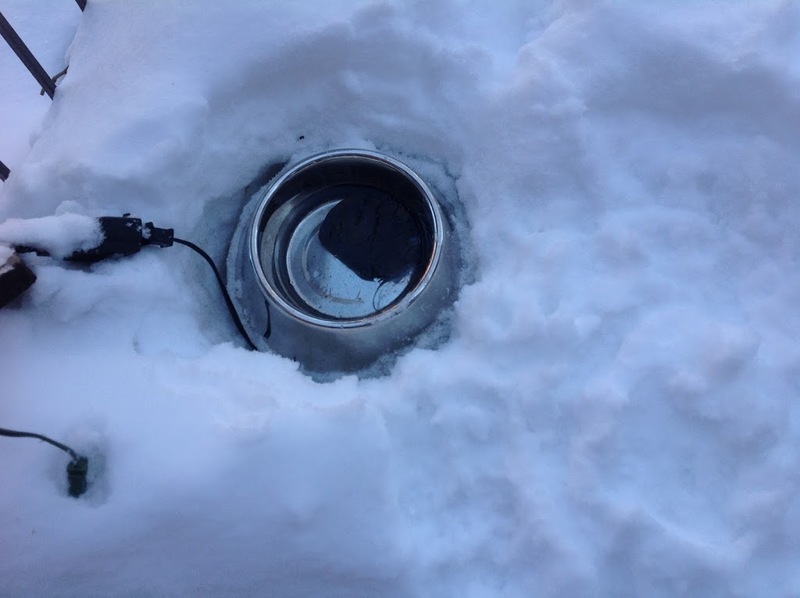 If you put out your spiffy home-made bird watering bowl out now, you’re giving the local birds an opportunity to discover it in time to see more of them over the GBBC, and for the rest of the winter. Each winter, I get to see house sparrows, dark-eyed juncos, northern cardinals, as well as the occasional white-throated sparrow, house finch, and downy woodpecker. I hope you get to see all these and more. A handy reference to help you identify the birds you see is here, at the Cornell Lab of Ornithology. Happy backyard birding! If you liked this post, sign up to the email list! It’ll have added goodies the blog doesn’t have – once a month, sometimes twice, after I’ve attained a certain threshold of subscribers. Help make that happen, and then you’ll never miss a blog post again!